Volkswagen says that over the next ten years the annual sales volume of the small SUV sector globally will grow from around 6.4 million to around 10.6 million units. 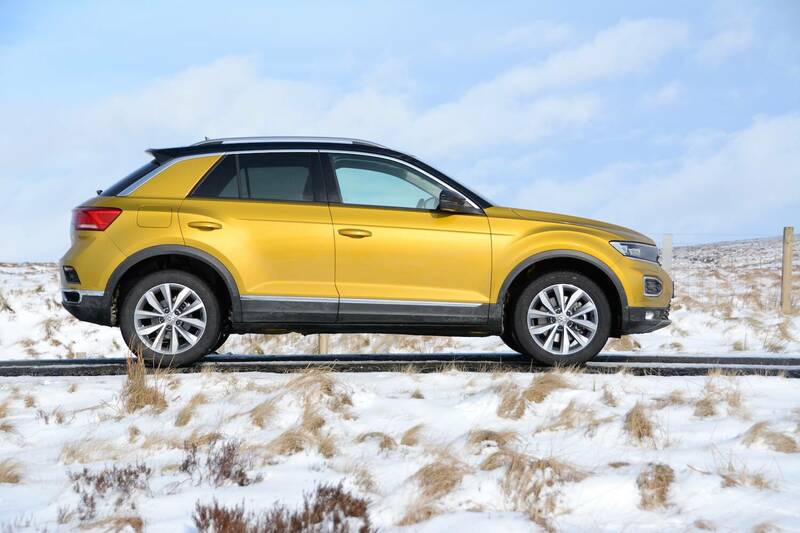 The T-Roc is therefore an important car for Volkswagen; have they got it right? The first thing that may strike you about the T-Roc is that it doesn’t look like a Polo or a Golf. For Volkswagen, this is quite a big deal. 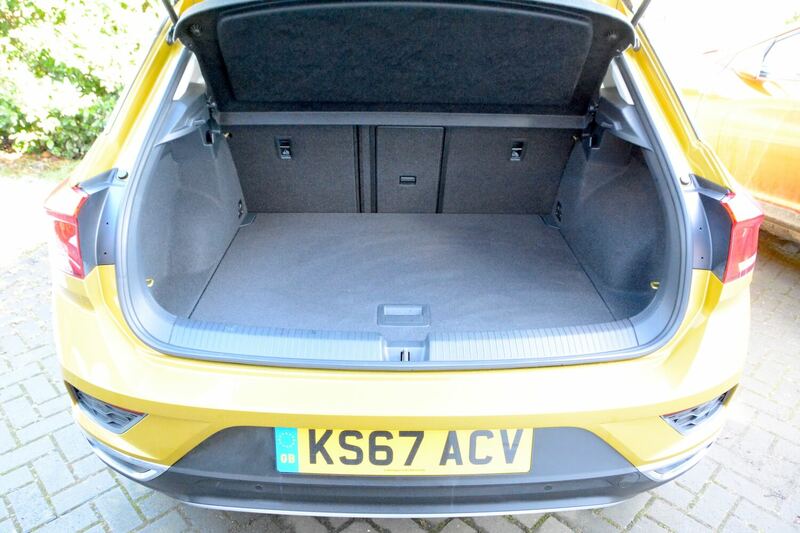 For us, this is refreshing, and most people are likely to find it more interesting than a boring hatchback. However you may notice a similarity with the Audi Q2, which is because it’s built on the same platform (and shares similar engines). Efforts have even been made to ensure the interior is more creative than in a typical Volkswagen Group product. 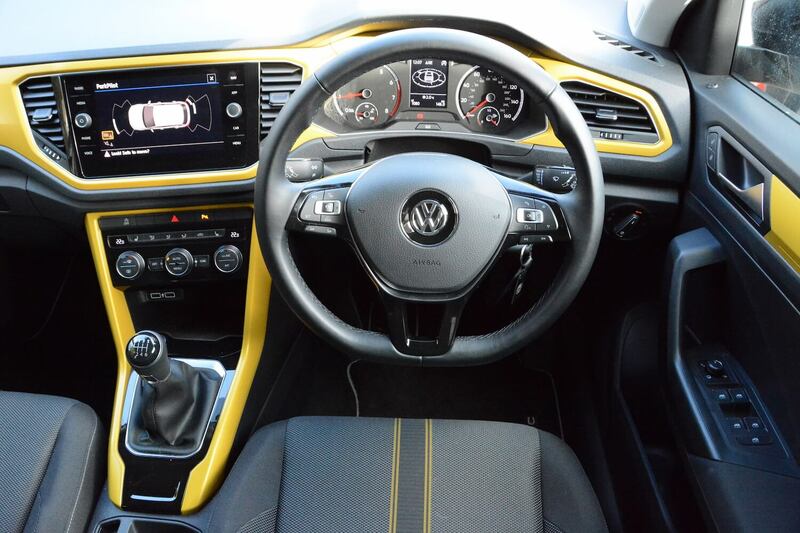 The ‘Turmeric Yellow’ colour of the external bodywork features on the dashboard trim, resulting in a Volkswagen interior that could almost be described as fun. The T-Roc is classed as a ‘small SUV’, but actually it’s a practical size – there’s room for five, and a decent-sized boot. Our test car featured a 1-litre, 3-cylinder engine with a 6-speed manual gearbox and front-wheel drive. A 1-litre, 3-cylinder engine sounds far too small to deliver sufficient propulsion for an SUV, albeit a small SUV, however, amazingly, the T-Roc feels responsive and fun (helped by the respectable 115 PS power output). 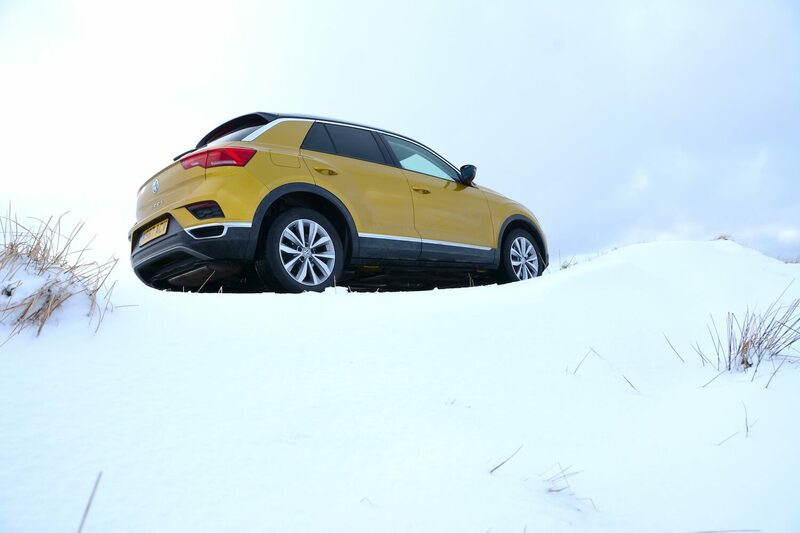 The engine, along with the entire T-Roc offering, is also quiet and refined under most driving conditions, and because it’s a small engine, the car feels light. 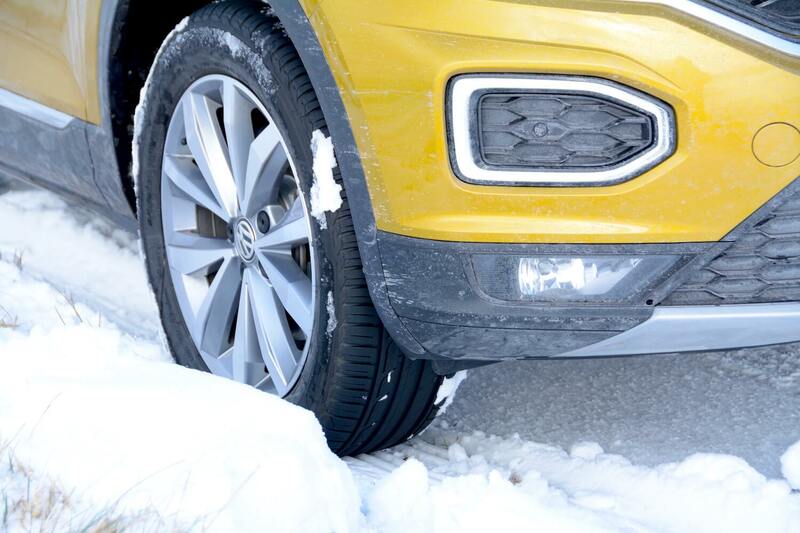 The result of all this is that the T-Roc is agile and good to drive. It’s easy to drive too, so it’s ideal transport for duties such as the school run, but it also offers a rewarding driving experience on winding B-roads – helped by the steering being reasonably well-weighted. The car’s light weight (1270 kg) also helps in the handling and the ride departments. There’s no selection of drive modes to choose from, but that’s fine – drive modes often feel like more of a gimmick in cars such as this anyway. 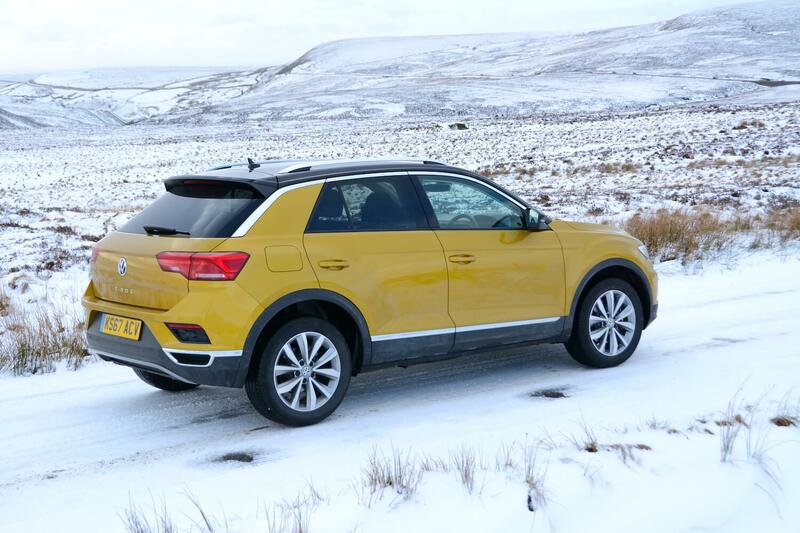 As you would expect in this class of car, this T-Roc was front-wheel drive (although four-wheel drive is available). For the vast majority of the year in the UK, front-wheel drive is absolutely fine, however it just so happened that it snowed during our week with the car (and on the T-Roc launch, see below). 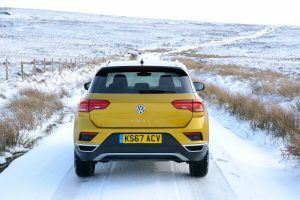 Unfortunately the combination of front-wheel drive, standard rather than winter or all-season tyres, and the default traction control setting, resulted in the car bringing itself to a complete halt on many snow-covered roads with even just a slight incline. We eventually found our way through the on-screen menus to switch off the traction control, which should have helped enormously with preventing the system shutting down all power to the front wheels, and being able to maintain some forward progress in the snow, but this was too late in the day as by that time we were on wet rather than snowy roads. However doing this was still beneficial, as even on wet/damp/cold roads, the front tyres struggled for grip, and when grip was lost, the traction control system cut all power. Not helpful when you’re half way onto a busy roundabout. 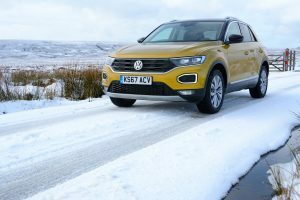 We’ll repeat what we’ve been saying for 12 years; in our view, all cars that are described by their makers as 4x4s or SUVs should have tyres that can get further in the snow or the mud than their regular hatchback counterparts. Subaru fits Yokohama Geolander tyres to its cars, and they can tackle any snow or ice that the UK can throw at them – they’re also perfectly fine during the remainder of the year. Anyway, back to the rest of the car. Aside from the external paint colour sneaking onto the dashboard (anything that brings a bit more joy to a dark Volkswagen interior is a good thing in our view), the rest of the dash has elements that will be familiar to drivers of new Volkswagens, including the infomedia system. Although this is good, especially when compared to some rivals (the satnav mapping is very clear, and there’s a dial to easily zoom in and out of the map), the touchscreen features shortcut buttons on the left and right; we’re all in favour of shortcut controls, but they’re on an extremely slippery plastic screen, so when you try and select a button while you’re driving, it’s very easy for your finger to slip. When reversing, the screen brings up an overhead outline of the car and any objects that you’re likely to collide with, but we’d prefer a reversing camera. There’s an electronic handbrake, and this has an auto release function, which is much better than some other manufacturers’ systems where you have to physically release the handbrake every time to move off, which can be very tedious. 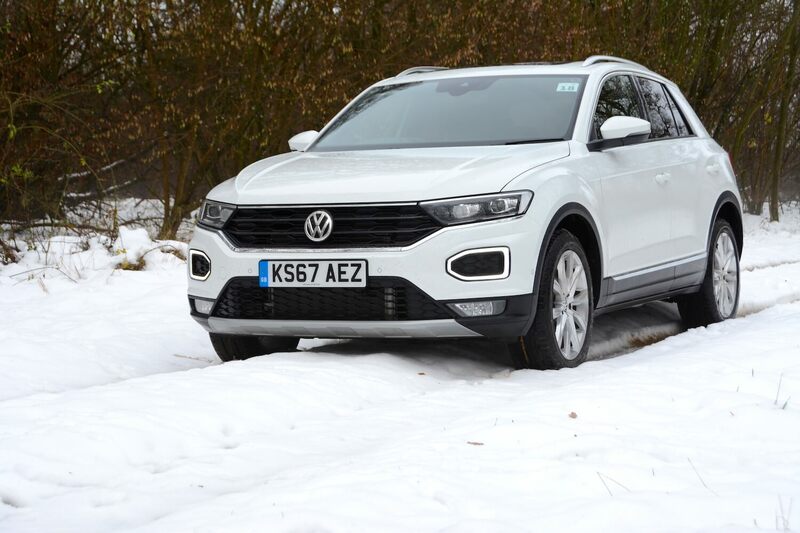 The Volkswagen T-Roc Design 1.0 TSI 115 PS 6-speed manual has an official combined NEDC fuel economy figure of 55.4mpg, equating to 117g/km CO2 emissions. This is respectable for a small petrol SUV. But what did we achieve in real-world driving? Over a week of mixed driving we averaged 45.1mpg. This is a decent result, especially when at least one day was mostly spent going nowhere on snow. The T-Roc displayed a useful driving range of 475 miles when the tank was full. 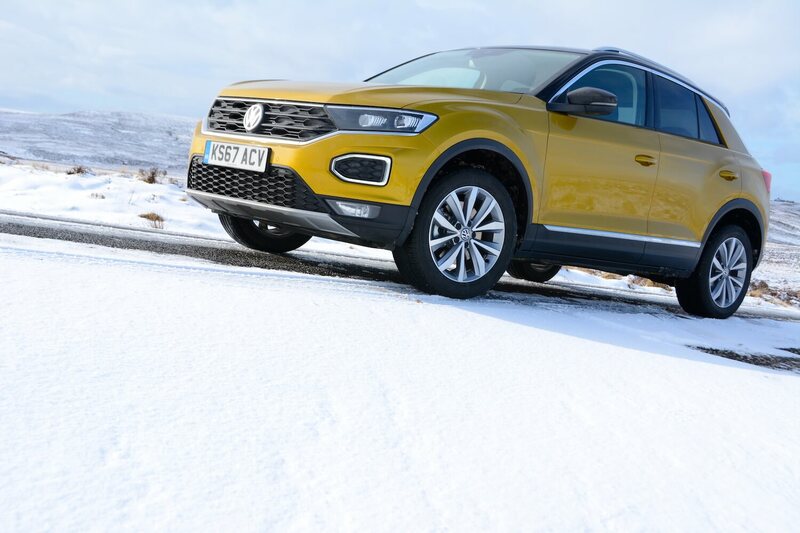 The Volkswagen T-Roc Design 1.0 TSI 115 PS 6-speed manual costs £21,125. Our test car had the following options: Discover Navigation infotainment system (£1,130), Winter pack (£285), silver anodised plated roof rails (£140), LED headlights (£880), front fog lights (£250), Turmeric Yellow metallic and black roof (£575) (Turmeric Yellow dashpad pack is a no cost option); all these items bring the price to £24,385. Although we tested the T-Roc with the 115 PS 1.0 TSI engine, this is the smallest engine in the range; there are four other power units, the 1.5-litre EVO 150 PS TSI petrol (with ACT Active Cylinder Technology to allow cylinder deactivation) and the 190 PS 2.0-litre TSI petrol, and two turbodiesels – the 1.6-litre 115 PS TDI and the 2.0-litre 150 PS TDI. The 190 PS petrol unit is available with 4MOTION all-wheel drive. We tested this model on the T-Roc launch (coincidentally also in the snow – see the white T-Roc in the photos) and as you would expect, it delivers considerably more performance and more traction than the front-wheel drive 115 PS 1.0 TSI. As well as the six-speed manual there’s also the option of a seven-speed DSG transmission. Trim levels are S, SE, Design, SEL and R-Line. SE trim is expected to be the most popular, with as much as 40% of sales, and up to eight out of ten T-Roc models sold in the UK are expected to be petrol-powered, with three quarters of T-Roc sales due to be with private buyers. There are various opportunities for personalisation, such as contrasting roof and pillar colours, and interior trim options. It may not result in a dramatic conclusion, but there is actually very little about the Volkswagen T-Roc to fault. 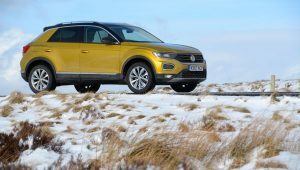 The 1.0 TSI petrol model on test felt light and agile, it offered decent performance and economy, it was refined and quiet, and it was a practical body style. And it even looks more interesting than the typical Volkswagen. At £21,125, it’s also reasonably affordable. It’s ideal for duties such as the school run, as well as offering some driving enjoyment on twisting B-roads. But it should be remembered that the 115 PS 1.0 TSI petrol model on test is the entry-point engine; there are two more powerful petrol engines, and two larger diesel engines. Here at Green Car Guide we’ve spent 12 years searching for cars with the best performance/economy balance. The 1.0 TSI petrol model actually works (surprisingly) well, but you’re likely to be even more pleased with the performance from the larger engines. So it’s ironic that the only main fault that we found with the T-Roc is the lack of grip in poor weather conditions, and both on Volkswagen’s launch event and on our own week-long test, what happened? It snowed. 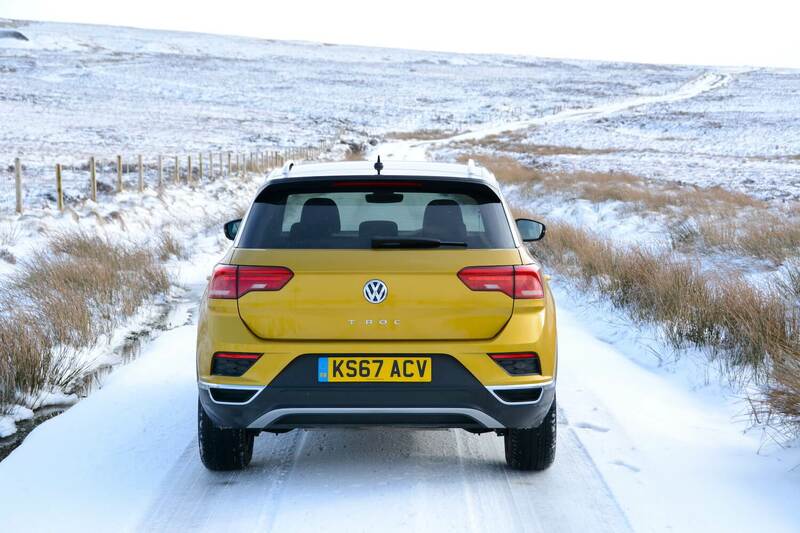 As reported above, the tyres on our test car were useless in the snow, and the traction control system also ensured the car was brought to a complete halt if conditions were slippery. On the launch event we tested the 190PS petrol model with 4MOTION all-wheel drive. 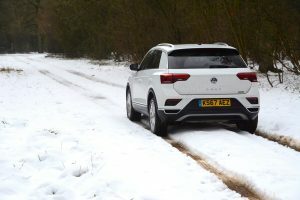 All-wheel drive meant that the car had more traction and could get moving in the snow, but the tyres still limited the ability to steer and brake effectively. 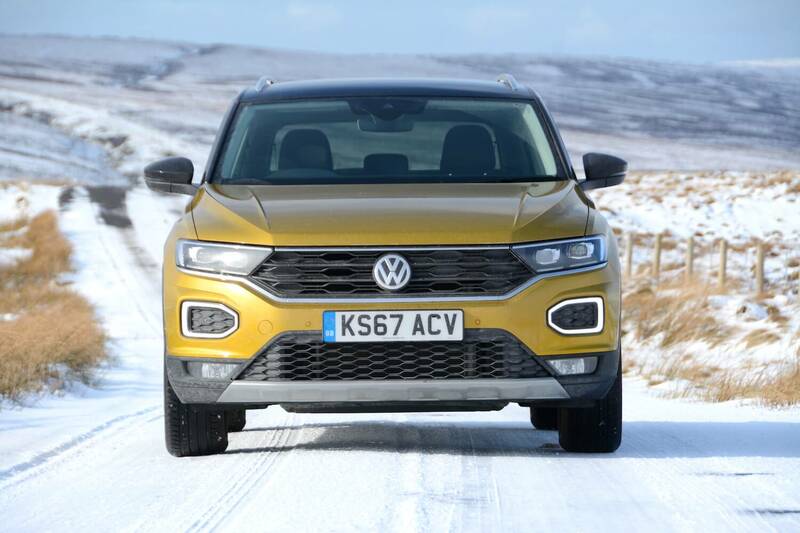 So our conclusion is that the Volkswagen T-Roc is likely to be a big success, and it deserves to be. Just make sure that if you buy one, fit it with tyres that have some grip in winter weather conditions, and familiarise yourself with how to de-activate the traction control so that the system doesn’t bring you to an undesired halt. Bearing in mind that the average T-Roc buyer in the UK is likely to be faced with snow for no more than one day per year, for the rest of the year the Volkswagen T-Roc Design 1.0 TSI 115 PS 6-speed manual is awarded a Green Car Guide rating of 9 out of 10.